As I reported in my previous Arbor Low post Kal and I were inside the stone circle taking dowsing readings. This post is the product of those readings, and, as I had hoped, the great stone circle did indeed give up some of its secrets that evening. The results I present here are only preliminary and cursory research into the amazing insights that we discovered, and I hope that over the course of the next year I can back up everything I am about to say with some solid on-the-ground fieldwork, dowsing, and more research. However, for now, I must content myself with my initial exciting findings, and must re-iterate that they are currently only theoretical and speculative. We dowsed inside the inner circle to find the point from which the radial alignment leys that Kal had found previously emanated. The spot was in between the two central large recumbent sets of stones. I stood in the centre whilst Kal walked around this point with his dowsing rods. Whenever he got a reading he stopped, and I lined up the compass with his dowsing rod and noted the bearing. After only two readings it became apparent that something quite exciting was going on here – the numbers were coming out incredibly familiar: Zero degrees – due North! Not 1 degree, 5 degrees, or 10, but spot on zero. Next – 45 degrees! Interesting. Well, it doesn’t take a mathematical genius to recognise these numbers as particularly significant when related to a circle!! Kal was oblivious to this, as he was simply walking around and stopping at particular points when the rods moved to a right-angle. I was the one whose eyebrows rose a little at each reading until I couldn’t contain myself any longer and blurted out something like, “This is impossible!”. I took the readings home, quite excited at the prospect of plotting them onto Google Maps and following the result – perhaps this would open up some new avenues of sites to explore along the lines, or new centres of spirituality to visit and dowse this year? Stupid question, as it turned out – of course it did. If those radials are extended out until they reach significant points, such as the end of the land, or a sacred site, then you get some pretty amazing coincidences across a very large area. How could the circle builders have managed to position the circle with such precision over such a wide area? By using star, sun and moon alignments alone? 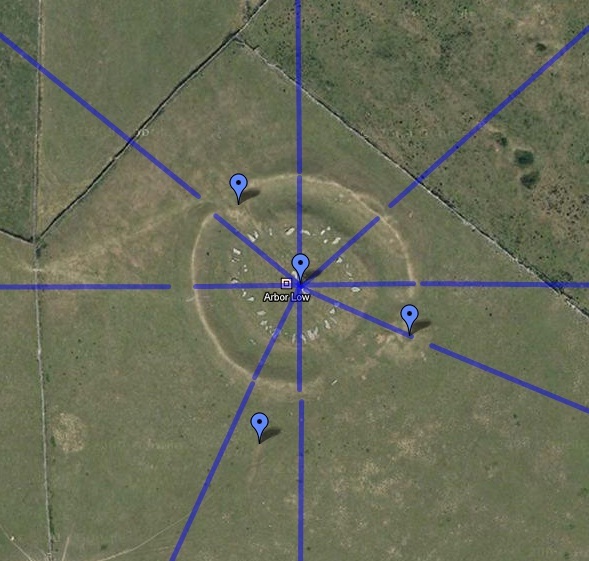 Here’s a link to the Google Maps diagram of the radials extended in all directions: Arbor Low radials. In this view you can click on each of the markers and see that each of them is a significantly named place, containing either the name of a Christian saint (popularly “Mary” or “Margaret“), or village names ending in “-ley”, “-lea” or “-leigh”. Some of the villages include the name “Cross“”, which I also think is significant, as it may indicate a location where the alignment leys I have discovered intersect with other ley lines. A rich source of further investigation in the years ahead, I feel. One final criterion for a significantly named place is the inclusion of the word “-stone“, which I believe indicates a standing marker stone may have existed there at one time, acting as a sighting stone indicating the direction and placement of the ley line. Such a village/town must not lie more than 1 mile from the central path of the neutral ley line. The path of the line must pass through at least THREE significant ancient sacred sites. There ought to be many references to saints names in the name of the villages, towns or the churches that the ley line passes through. NORTH: one close and one direct hit on a line extending 118 miles. SOUTH: three close and five direct hits on a line extending 142 miles. EAST: no hits or near misses on a line extending 99 miles. WEST: two close and two hits on a line extending 140 miles. Eight hits on the random southern line, eh? But let’s look at the clustering of those hits – they almost ALL appear in the small space between the M40 motorway in Oxford (a hot spot for ancient sites and leys) and the M3 motorway in the space of about 20 miles. I venture to suggest we have actually hit an existing ley line in that area, or some very close to it. The total line extends some 140+ miles in total, mostly devoid of hits. How many ancient sites were passed through in this test? NONE. How many saints names were in the names of villages or towns near to this random line? NONE. Did it align three or more sacred sites? NO. Okay – so the “ley” name criteria was occasionally met in clusters, but the other criteria were completely devoid. Let’s compare that now with the lines that I found emerging from the Arbor Low stone circle. I’ll do the details later, but for now, let’s just compare those cardinal hits and near misses. NOTE: For the latest version of this map see my Google Map. Let’s examine each of those radials in turn, and see which significant places they touch. NOTE: all the lines have at least ONE sacred site because they all emerge from Arbor Low. The northern ley ends at Holy Island, and goes straight into the Lindisfarne Priory and ends at a place called Mary Gate. One of the descendants of Llywelyn the Great (c. 1173-1240) was born in ‘Raby with Keverstone’, which is an interesting connection to Yr Elen mountain, a peak conjoined with one named Carnedd Llywelyn, meaning “Llywelyn’s cairn”. UPDATE 31st January 2011. I have been to Shipley and confirmed that a neutral energy ley exists in the town centre running North-South through the Hockney pub, a memorial statue and a labyrinth design depicting twin entwined serpents. I dowsed that this is the same energy ley that connects to Arbor Low. I suspect that other energy leys exist in the area too, attested by the sheer number of places ending with the suffix “-ley”. Possibly travels through the Barbrook series of stone circles. Cannot find an end point, however, as many of the circles on the eastern seaboard would have been timber circles, and long since disintegrated. The line ends, I believe, at Bolinbroke Castle, made famous for being the seat of many of England’s kings, as recounted famously in several Shakespearean plays such as Henry IV, who was born there. Wikipedia link. The only other significant place I could find on this line is the Nine Ladies Stone Circle, also in Derbyshire. Perhaps the line ends there – this is something I will have to test out in the field by checking points along the line. The funny thing about this line is that its bearing is not exactly 45 degrees. If a line is drawn at exactly 45 degrees then it slightly misses Nine Ladies, and misses Bolinbroke by a mile or so by the time it gets out east. Now, despite what I said earlier about the fact that the line as measured on the night was 45 degrees exactly, I actually think this might be a case for saying that I may have taken the measurement slightly wrong for this line. I say that because I am, indeed, fitting this line retrospectively based on the evidence of the sacred sites and villages named “ley” that I only discovered when I traced the line across the land. If you follow the line and see that the sites fit if the line is angled slightly further than 45 degrees I think you’ll agree it’s a more convincing case for the existence of a ley line. However, by the criteria I laid out earlier, this line is not wholly convincing – only two ancient sites appear on it, and not three – unless Bolinbroke Castle could be considered to be an ancient site. We may never know. Where’s Time Team when you need them? The least convincing of the radials, as I can’t find many ancient sites along this line for quite a long stretch. This is the problem with most of the lines that extend over the eastern side of the country – the geology of the area does not encourage the building of stone monuments. Instead, it would appear that their ancient monuments were rendered in timber, and then never upgraded to stone, as they had been elsewhere where suitable stone was abundant. There is clustering of sites on this line, with a section in the middle (between Lambley near Nottingham and Wiggenshall SMM in Norfolk) where there are neither correspondences or ancient sites listed. I am quite unsure about whether the line continues beyond Nottingham at the moment. The only thing I have to make me want to keep the line the length it is would be the end point being the mouth of the River Blyth, which is such an exact geographical feature for a line to end at. A mile further north or south would have been less convincing. End points being the mouths of rivers seems to be a feature of the Arbor Low radials. The southern ley ends at St Catherine’s Hill on the northern edge of a town called Christ Church at the mouth of the River Avon and River Stour. Either that, or it ends at the Breamore (Bremmer) sites just a few miles further north, where there is a “Giant’s Grave” long barrow, a “Giant’s Chair” and an ancient turf maze called the Miz-Maze. Passes next to Stonehenge and other Wiltshire sites, and through Marlborough. “One “miracle” legend that local heritage does not play up is that Christchurch, like Vortigern’s citadel, was reportedly consumed by fire from heaven – no doubt because the reason given is that it was devastated by a fire-breathing dragon sent to punish the town for its wickedness. An account by a visiting French monk, Herman of Laon, has the town being burnt by a fire-breathing flying dragon in 1112/1113. Herman came here with a group touring SW England to raise funds to rebuild their home church, but got an unwelcome reception here. As Herman’s group left, they looked back and were pleased to see the town being burnt up by a dragon in revenge for the insult to their Lady of Laon. Passes through the legendary site of Caerleon, reputed site of King Arthur’s Camelot and long-time Roman Fort. link. “When the feast of Whitsuntide began to draw near, Arthur, who was quite overjoyed by his great success, made up his mind to hold a plenary court at that season and place the crown of the kingdom on his head. He decided too, to summon to this feast the leaders who owed him homage, so that he could celebrate Whitsun with greater reverence and renew the closest pacts of peace with his chieftains. He explained to the members of his court what he was proposing to do and accepted their advice that he should carry out his plan in The City Of The Legions. (from ‘History of the Kings of Britain’ by Geoffrey of Monmouth). The western ley goes to the imposing mountain of Yr Elen. No-one seems to know why it is dedicated to Elen, but I can hazard a guess – it is Elen of the Roads – the spirit who shows the seeker the way, who makes visible the invisible paths of energy, the ley lines, and here stands this summit: due West of Arbor Low, on a ley line, and dedicated to Elen. No other sacred sites along the way though, unless you include the town of Mold, which is steeped in history and pre-history, and whose castle may have been the site of a former, much more ancient, fort or protected sacred space. Or perhaps its church dedicated to St.Mary may have a much older history. But that’s speculation. “The Rev William Thornber states that a round cairn or cairns formerly stood on the site of the Lodge of Stonyhill, and he was told that Mr. Fisher, the proprietor of the field, had carted away upwards of twenty loads of soil, burnt red and black, from the site of a large circular cairn, which had made it difficult to identify. He also states that adjoining the cairns are two wells, one called the Fairy Well, or Wrangdomwell, and the other Bull Spring, which issues from a huge oblong mound of stones, in the Bull Meadows, which he supposes to be of artificial origin. He says that the Fairy Well was still resorted to with offerings of rags , nails and pins, and that he had found, himself, nails, leather thongs and-an old shaped knife, after the meadows had been ploughed. Again, I’m not sure if this line really constitutes being called a ley line. There are very few sites above random chance, the sacred site at the end of the line may or may not have been of significant size and status, and there are no known extant or remnant sites in between Arbor Low and Blackpool. As you can see, some of the radials are more convincing than others. Over the course of the next few years I aim to see whether there is any dowsing evidence, or local custom that would back up these suppositions. Just wondering if the Pagan Healing Spring ‘St Ann’s Well’ in Nottingham is on the layline going roughly through the city that you show. I took a closer look at my line and the locationof the well and they are separated by some miles. Here is a link to the well’s location on “The Wells Road” (see Megalithic Portal’s page), and my line goes through the area known as Burton Joyce some miles to the North East of this location. If you’re in the area, though, why not dowse the well and its locality and see if you can trace any energy lines that might pass through or close to it? Traditional dowsers would say you might expect to find a water line or hydrostat in the area. I don’t know what these are, so don’t ask me! The BSD will have all the right definitions for water dowsing! 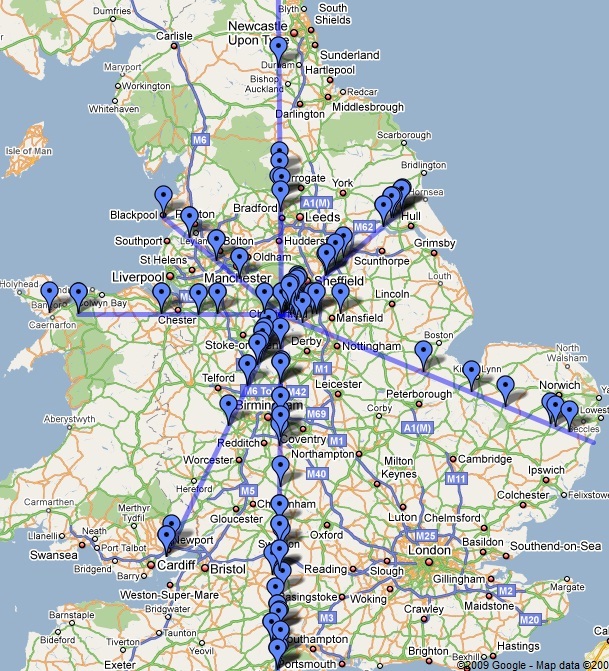 I came across this site while snooping around the web to find out if Tyldesley/Shakerley are located on ley lines. I would be interested to know if you have uncovered any further evidence supporting this? Hi, I live in Tarporley, Cheshire and note from the article that we are mentioned. Can I ask a quick question. Can proximity to a Ley Line effect Mobile and TV Reception. The reason I ask as we were in a Mobile Shop recently. We were asked for our postcode which was entered into the shop computer. When Tarporley High Street came up the whole of the High Street was shown as very poor reception. Strangely this was exactly the High Street and reception up to the High Street from all directions was fine. We do suffer from really bad mobile and TV reception here. I live on the High Street. I am also concerned that we may be living on, near a black ley line. How do I investigate this further? Very interesting site. Thank You. Richard Thomas. You raise some interesting points. My father used to live in Tarporley but at that time I wasn’t really into dowsing so I never got around to dowsing the area. However, your questions have intrigued me and I will go along one evening this week and see what I can find. At the moment all I can say is that I have noticed some unusual effects upon compasses and phones when standing in ley lines, but have not had a reason to check this further. However, I will take my phone with me and see whether its compass suffers from the same effects when on or away from the High Street, and whether reception is poor. Good questions. I will report back soon,. If you wanted to check it for yourself, you only have to go dowsing and ask whether you are standing on a black steam and the rods should be able to indicate that for you. Of course, if you’ve never dowsed before….you’ll have to learn first! But it’s easy, really. Everyone (almost) can do it. I was snooping around Tarporley last night with my dowsing rods and phone, checking reception and dowsing response along the High Street. As far as the phone reception goes, I think it must be down to your network prvider. I’m with O2 and the reception all the way along the street and beyond it was excellent. Far better than in my own area! Then I dowsed from the chip shop all the way down to the church. No black streams at all. No bad energies in the whole area, I found. It was all good energy. So, please feel free to have a dowse for yourself, but I couldn’t find anything relating to earth energies, or human energies, that would make your TV or phone reception poor. I think it’s a purely technical thing related to your provider. Hi, when dowsing my garden i found three paralel lines not sure what lies East but West leads to Gatley. Looking at an old map (and only on one year’s edition) shows Stonepail Close which used to be Stonepail Stone Circle. Its not on old maps as they weren’t considered important, and property developmemt wiped it from modern maps. This meets the criteria of being close to the n/west line and ends in ‘ley’. That’s the kind of local knowledge that I really appreciate! Thanks for posting that for me. That’s another piece of the puzzle slotting into place, but only your intimate knowledge of the old stone circle could have revealed the true significance of the ley in that area, so thanks for that. I’ll now go and see how that works with my existing drawn line. I wonder how many points I would get for each radial from Arbor Low? I have added a further post(on Pagan Fools – TMF) about the energy lines just south of Lindisfarne, It conjectures that the serpent energy line traverses through Bamburgh Castle, on through Adderstone and then to Ros Hill(Hill Fort). Its not established but these places look good for investigation. Yet more good work being done to verify the line “on the ground” whcih is the only way to get a real feel for the way these lines snake around. I think your concept of the lines moving around a central point is entirely conceivable. Hamish Miller found this when he dowsed the Michael/Mary Line. What he was finding then was the male or female energies that intertwined around the neutral central line. What would be valuable, if you get to check the next few nodes on this line’s travel, would be for you to test whether the line you were dowsing was M, F or N in frequency. Miller used to say that the sacred sites were the coming together of those M+F lines, and that spirals (or more accurately cones) of energy would be emitted from those node points. I find this too, so I would be interested to see whether you distinguish between these subtle qualities of energy when you dowse these places along the route. I will be writing a post soon about trying to locate another of the Arbor Low lines that runs SSW to Caerleon. Watch out for that! As a relative beginner at dowsing,(ie I’ve had little tuition) I cannot yet tell the difference between different typse of energy(M,F,N). Have you got any pointers that would help me. a) Male energy often spirals clockwise, and travels in long slow waves. It spirals fewer times round than female energy, so a typical spiral may only turn three or four times until the centre is reached. This form of energy will seek to move around solid objects and obstructions. b) Female energy often spirals anti-clockwise and travels in random paths. Its waves often have a higher amplitude than the male equivalent, and occur closer together (oscillate faster). A typical spiral may have eight or nine turns until the centre point. This form also moves around obstructions and if blocked will spiral. c) Neutral energy tends to travel in straight lines, although we have found wide circles of it too. It travels point to point and ignores interruptions and barriers. We don’t tend to find neutral energy forming spirals, but it can be formed (we call this primal energy) into shapes, so you may find neutral energy coating or surrounding specific objects of veneration like a reigious statue, or an object of worth. I hope that helps you. Asking the dowsing rods to identify the type is the easiest way. Simply ask, “Is this energy I am crossing male?” and move through the types until you get a confirmation. It’s pretty reliable. If you don’t indentify with the paradigm “Male/female/neutral” you could try “sun/moon/star” and see if that gets a better response. Everyone’s different! It’s a bit old now, but still has some background info that might help you form a picture of how Kal and I categorise the different frequencies of subtle energy. I’m Adding the link to my post on The Motley Fool, as requested. For readers its about my visit to Lindisfarne(Holy Island) and the finding of the energy line at the northernmost edge of the North/South leyline. Great site Gwas, keep up the good work. Excellent, thank you, Serpenteer. I appreciate the post. Considering I have only drawn the lines by extending them from a small scale plot using a compass bearing on the ground I am quite surprised that I even got close with any of them! So pleased to hear you could validate that there actually is such a ley line there, and even better that you could help everyone by being so precise about its location.